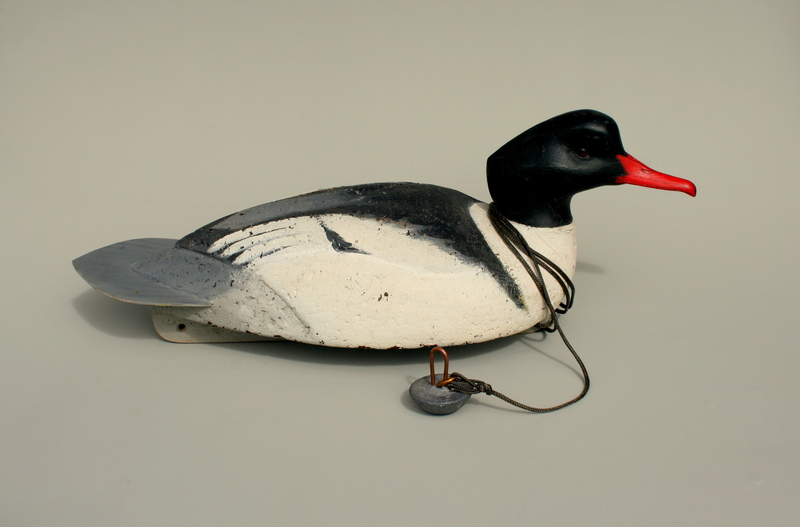 So far I have only carved one Common Merganser Drake. This bird has a body of black cork (aka refrigerator cork), a white pine head and a plastic tail insert. The cork was one of the last pieces I had kicking around the shop and the plastic was scavenged from the roadside – what looked to be a piece of molded interior from some GM car – I always picture a Chevy wagon. It was stiff enough but stays flexible even in single-digit cold. The decoy has no bottom board but a does have a full-length yellow pine keel. The only thing I would do differently today would be to use a lighter fastener for the head. I had been using 1/4-inch galvanized lag screws – a holdover from my youth – and it’s just a little too heavy, especially heading into a current. Now I would use either an extra-long deck screw or a 5″ stainless screw eye – of which I now have a supply in my shop. The paint on this bird is my idea of what a gunning paint job should be – quick to do and yet highly accurate. This bird has served us well. He gets added to the rig only late in the season, when all the small waters are iced up and the Shelldrake make their way up the rivers. We do not shoot many Shelldrake – in most seasons none at all. Nevertheless, this bird works. Most Shelldrake give it a look as they scream upstream or downstream. It is especially fun to watch its kindred spirits stool right in to it. And, I am always amazed how you can make out the pale salmon wash on the breasts of the big drakes – the Bull Shellpeckers – as they fly past or swim through the decoys. I also enjoy listening to the croaking from both sexes and love their “reverse” periscope way of checking out the prey base – with just their heads stuck beneath the surface as they paddle along.